The Steelmen fell behind to a spectacular Jason Cawley strike just before half-time with the hosts doubling their advantage through John Pykett with Joel Carta’s late effort proving to be only a consolation. 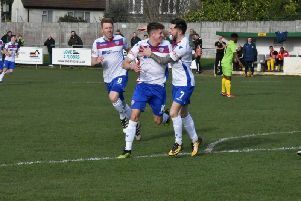 The match was played out in front of over 1,500 fans at the Victoria Ground and the result saw Corby fall nine points behind the table-toppers and eight behind second-placed Peterborough Sports in the Evo-Stik League South Division One Central. It now looks like Kinniburgh and his team will have to gain promotion through the play-offs if they are to go up this season. And the Steelmen boss said: “The first half, we have created enough chances to score at least one but it is 0-0 with 44 minutes on the clock and their boy pulls out a bit of magic to flick it over and hit a volley in the bottom corner with probably only their second shot on target. “I thought we were on top of the game in the second half, we had opportunities to get back in it. We had three really good chances where you would score more often than not. We have created enough chances to win two games. “They have had four or five shots on target and scored two and it’s the same old story. “That’s my biggest concern, our decision-making has got to be better at both ends of the pitch. It’s New Year’s Day since our last clean sheet and it’s not good enough. Kinniburgh believes the “fine margins” are going against his team at the present time. And he insists it is up to them to try to “take the extra step” in the remainder of the campaign before the play-offs arrive. He added: “It’s fine margins. We have got to a level this season where the club has not been for three or four years. We now have an expectation on us to go and deliver and quite rightly. “We have got to that good and consistent level but it’s now about teams who can go to the next level and take the extra step. “The margins between winning and losing are so small. They are not going in our favour at the moment and it’s our own doing. You have to keep clean sheets and keep yourselves in the game when you’re missing chances.